We’ve posted a new contract in the forms library — and it’s available in MS Word (no charge, as always). It’s meant to serve as a customer’s primary contract for purchasing any and all IT (other than hardware or IaaS): namely, licensed software, software-as-a-service (SaaS), and/or IT professional services. You can use it to acquire one or more of those, and you can use it for one project with the vendor or many. The new form is very friendly to the customer. (So vendors: don’t use it as your own form!) It’s particularly appropriate for a large company that buys diverse IT products and services. The structure might seem complex at first, but really it isn’t. 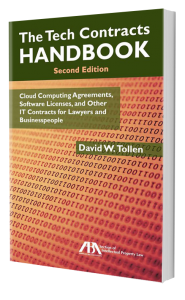 When you fill out a contract Addendum (an order, essentially), you check whether it’s (a) for licensed software or SaaS or (b) for professional services. That tells you which parts of the contract apply to that Addendum. If it’s for licensed software or SaaS, Part II applies. If it’s for professional services, Part III applies. Part I applies to all deals. Click here for the new ITMA contract form.